The kinetochore is where the SAC initiates its signal monitoring the mitotic segregation of the sister chromatids. A method is described to visualize the recruitment and turnover of one of the kinetochore proteins and its coordination with the chromosome motion in Drosophila embryos using a Leica laser scanning confocal system. Sinclair, M., Huang, J. Y. Studying Mitotic Checkpoint by Illustrating Dynamic Kinetochore Protein Behavior and Chromosome Motion in Living Drosophila Syncytial Embryos. J. Vis. Exp. (64), e3763, doi:10.3791/3763 (2012). The spindle assembly checkpoint (SAC) mechanism is an active signal, which monitors the interaction between chromosome kinetochores and spindle microtubules to prevent anaphase onset until the chromosomes are properly connected. Cells use this mechanism to prevent aneuploidy or genomic instability, and hence cancers and other human diseases like birth defects and Alzheimer's1. A number of the SAC components such as Mad1, Mad2, Bub1, BubR1, Bub3, Mps1, Zw10, Rod and Aurora B kinase have been identified and they are all kinetochore dynamic proteins2. Evidence suggests that the kinetochore is where the SAC signal is initiated. The SAC prime regulatory target is Cdc20. Cdc20 is one of the essential APC/C (Anaphase Promoting Complex or Cyclosome) activators3 and is also a kinetochore dynamic protein4-6. When activated, the SAC inhibits the activity of the APC/C to prevent the destruction of two key substrates, cyclin B and securin, thereby preventing the metaphase to anaphase transition7,8. Exactly how the SAC signal is initiated and assembled on the kinetochores and relayed onto the APC/C to inhibit its function still remains elusive. Drosophila is an extremely tractable experimental system; a much simpler and better-understood organism compared to the human but one that shares fundamental processes in common. It is, perhaps, one of the best organisms to use for bio-imaging studies in living cells, especially for visualization of the mitotic events in space and time, as the early embryo goes through 13 rapid nuclear division cycles synchronously (8-10 minutes for each cycle at 25 °C) and gradually organizes the nuclei in a single monolayer just underneath the cortex9. Here, I present a bio-imaging method using transgenic Drosophila expressing GFP (Green Fluorescent Protein) or its variant-targeted proteins of interest and a Leica TCS SP2 confocal laser scanning microscope system to study the SAC function in flies, by showing images of GFP fusion proteins of some of the SAC components, Cdc20 and Mad2, as the example. The transgenic flies used in this demonstration: Ubq-gfp-Cdc20 (II), Ubq-rfp-His2B (X*); Ubq-gfp-Cdc20 (II*), Ubq-gfp-Cdc20 (II*); mad2EY(III*) and Ubq-gfp-Cdc20 transgenic flies were previously generated in the lab via a standard P-element mediated transgenic approach10,11 and Ubq-rfp-His2B is a kind gift from Yohanns Belaïche at UMR 144 CNRS/Institute Curie, Paris, France. They were introduced into a Mad2 mutant background via standard Drosophila genetics. The mad2EY original mutant line was purchased from the Bloomington stock center. We will not discuss the procedure used for raising the transformants in this protocol. Note: * represents the chromosome number. Maintenance: Transgenic flies were maintained at 25 °C in plastic vials containing fly food and with additional dry yeast powder on the top. The vial was routinely replaced every 3-4 weeks depending on growing conditions (Figure 1). An appropriate amount of the fly food mix was heated with constant stirring to dissolve the components. About 8-10 ml of this medium was distributed as slurry into each plastic vial (2.5 cm diameter x 8 cm length) using a Jencons Scientific Ltd peristaltic pump. When the food slurry was set and has cooled to room temperature, the vial is then plugged with a cotton foam plug. These foods vials are placed in a tray that is then sealed in a plastic bag and kept at 4 °C for later use. About 50 pairs of 2-3 day old adult flies were transferred to a fresh fly food vial supplied with additional dry yeast powder on its surface at 25 °C for laying embryos. The flies are then transferred to a fresh vial every hour and leave the embryos in the vial for 30 minutes to ensure some of the collected embryos are aged around nuclear division cycle 8-10 when the nuclei are gradually migrating to the cortex and organized as a single monolayer. The first hour collection is normally discarded as it often contains aged embryos that were retained in the female bodies when conditions weren't suitable for laying. Take out a 50 x 22 mm coverslip and slightly wet its four corners on one side with a very small amount of water using a moist fine pen brush and put it on a microscope slide so that the coverslip does not move because of the capillary surface tension caused by the thin liquid film. Apply a thin strip of heptane glue across the middle of the coverslip, the heptane should evaporate in seconds to leave the glue on coverslip. Cut another coverslip with a diamond pen into small squares (~1.5 mm2), pick up one and place it on one end of the glue strip (this is used to open the needle tip when microinjection is required) and save the others for future use. Take another microscope slide and stick a piece of double-sided sticky tape about 2 cm long to it and peel off the cover paper. (See Figure 2A & B). Transfer the flies to a fresh food vial and use a moistened fine pen brush to transfer about 50 eggs onto the double-sided sticky tape on the slide with an appropriate amount of liquid to allow the eggs to be spread out. When the liquid has evaporated the eggs will stick to the tape. Under a dissecting microscope touch the eggs several times along their long axis using the outer side of one half of a pair of tweezers gently till the chorion is broken and open but leave the embryo in the chorion shell to prevent rapid dehydration. Continue this process till 10-20 of the eggs has been treated (depending on the number of the eggs required for a single experiment). The embryos can then be picked up and removed from the chorion shell and gently placed on the glue strip one by one. The eggs could be placed and aligned either with the long side of the embryo parallel or anti-parallel to the long side of the glue strip depend on if they are to be microinjected. The embryos can either be covered immediately with an appropriate amount of Voltalef 10S oil (a 5:1 mixture of Holocarbon 700 oil and 27 oil, Sigma) to prevent further desiccation for immediate imaging or placed in a desiccation chamber for 3-8 minutes to dehydrate them further depending on the humidity of the room and the purpose of the experiment. The dehydrated embryos should be covered with 10S oil when appropriate to prevent over-dehydration if microinjection is required. (See Figure. 2C, D & E). Time-lapse or single images of living embryos are collected using a Leica TCS SP2 inverted confocal microscopy system with a HCX PL APO CS 40X 1.25 oil immersion objective (60 or 100X objectives can be used too depending on the purpose of the experiment, the higher the magnification used the more photo bleaching will occur). When imaging multiple fluorophores, which have overlapping spectra and are co-expressed in the same embryo, each fluorescent protein emission wavelength was collected sequentially. The excitation and emission wavelengths available on the Leica TCS SP2 system are: GFP, λEx: 488 nm and λEm: 500-600 nm. RFP, λEx: 543 nm and λEm: 555-700 nm. A single image was commonly obtained as an average of 2 scanlines with an average of 2 frame-scans. This takes a minimum of 6.3 seconds to scan a 512x512 pixel image in a simultaneous scan mode, and 15.44 seconds for a sequential scan mode and produces a good signal-to-noise ratio. These times need to be taken into account when setting up the time frames for time-lapse image collecting. The pinhole was normally set to 1-2 AU (airy unit), and the laser power was adjusted to the lowest level possible to avoid any significant photobleaching. Prepare the needle before the experiment. We prefer to pull the needle from siliconised glass capillaries (GC-100-10, Harvard) using the flaming/brown micropipette puller (Sutter Instrument, Model: P-97) with parameters: heat = 600, pull = 90, vel = 70, del = 150. Backfill the needle with 1-2 ml of an appropriate concentration of the reagent in injection buffer using a fine loading tip (20 μl Eppendorf lot: W215818J). Mount the needle in the needle holder on the microscope with the pressure pipe connected to the Eppendorf injection control system. Find an embryo under the 40X objective and find the needle shadow without changing the focal plane by moving the needle into the center of the field of view and gradually lowering it to the right focal plane. Move the embryo away gently to find the small square of the broken coverslip pre-mounted at one end of the glue strip. Very gently move the needle tip until it hits the edge of the small square coverslip and gently breaks it open. Move the embryos back into view and select the embryo of the right age for injection. I normally inject the embryo at nuclear division cycle at 5-7 as this is before the nuclei migrate outwards to the cortex. The nuclear division cycle stages can be determined by a quick scan of the fluorescent signals of the GFP-Cdc20 or the nuclear signal of the RFP-Histone 2B prior to injection9. Carefully move the embryo close to the needle and readjust the focal plane for both the embryo and the needle. Move the embryo into the needle and inject a drop of the reagent into the desired position and move the embryo away (or follow the instructions for the microinjection system). The embryo can be injected from its posterior or from the side depending on the purpose of the experiment. Figure 1. 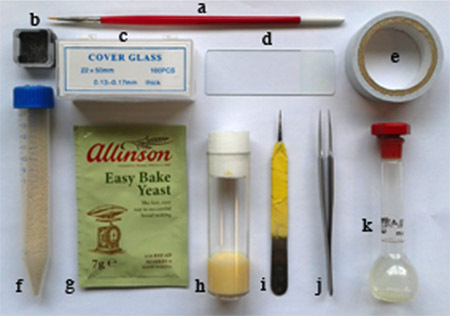 Required materials: a. fine pen brush, b. small square broken-glasses container, c. 22 x 50 mm coverslip, d. microscope slide, e. double-sided sticky tape, f. dry yeast powder in test tube with holes on the lid, g. yeast granule used for fly maintenance, h. fly food vial, i. a half of a tweezers used for dechorionate embryos, j. a pair tweezers, k. heptane glue liquid container (volumetric flask). Figure 2. 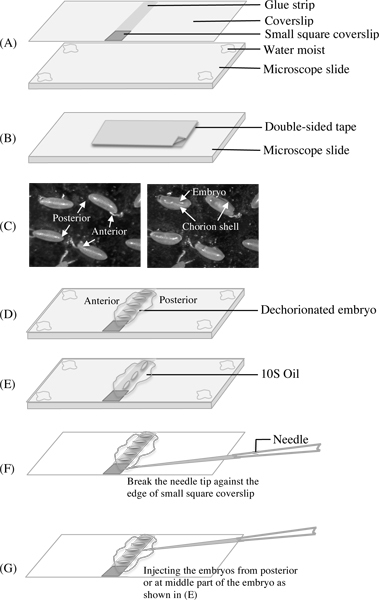 The diagrams show the preparation of the coverslips and slides in step 4, embryo dechorionation in step 5 and needle preparations for microinjection in step 7. A. The top picture shows a coverslip with a strip of heptane glue across its middle and a small square of a broken coverslip stuck to one end. The bottom picture shows a microscope slide with a thin layer of water at its four corners to hold a coverslip. The reason for using a slide to hold the coverslip is to keep roughly the same focal distance as that found when you have double-sided tape on the slides and thus avoiding refocusing the microscope while you are dissecting and transferring the embryos between tape and coverslip. B. A slide with a short length of double-sided Scotch tape applied before peeling off its cover paper used for dechorionating the embryo. C. The picture on the left shows embryos with intact chorion shells with marked anterior and posterior ends; the picture on the right shows the embryos in the broken chorion shells before they were transferred onto the coverslip with the glue strip. D & E. Diagrams showing two ways for transferring, placing and aligning the dechorionated embryos on glue strips. The embryos were covered by 10S oil after an appropriate desiccation period. F & G. Diagrams showing how to open the tip of the needle and position it so as to inject. Example 1: A time-lapse movie (Figure 3) shows the dynamic kinetochore recruitment of GFP-Cdc20 and chromosome motion in living Drosophila syncytial embryos. The region of interest from original time-lapse sequence images was determined/edited and automated-batch converted using Photoshop software. The movie was assembled using QuickTime software. Figure 3. A time-lapse movie shows the dynamic kinetochore recruitment of GFP-Cdc20 and chromosome motion in living Drosophila syncytial embryos. (A) Time-lapse images were taken from a transgenic syncytial embryo co-expressing GFP-Cdc20 (in green) and RFP-Histone 2B (in red) fusion proteins and were recorded using a Leica TCS SP2 confocal system at 18 °C during nuclear division cycles 7-8. Frames were taken every 10 seconds. The frame with the cells already in prophase is treated as the zero time point10. Click here to view movie for Figure 3A. (B) GFP-Cdc20 can be readily observed on prophase and prometaphase kinetochores (B3 & 4, white arrows) and persists on metaphase and anaphase kinetochores (B5 & 6, white arrows). GFP-Cdc20 is excluded from interphase nucleus (White arrowhead), entering the nucleus by early prophase. Chromatin morphologies were determined using co-expressed His2BmRFP as markers (B8-14). Bars= 5mm. Example 2: SAC functions can be studied by manipulating the embryos by microinjecting antibodies, fluorescently labeled proteins or chemical compounds of interest that potentially trigger the SAC. For instance injecting colchicine to depolymerize the microtubules so provoking the SAC as indicated in Figure 410. Figure 4. Mad2 is essential for colchicine-invoked SAC function10. gfp-cdc20; mad2+/+, gfp-cdc20; mad2EY (mad2-/- null mutant) and gfp-mad2; mad2EY embryos were treated with colchicine by microinjection. Time-lapse confocal images were taken before (01, 07 & 13) or after injection (02-06, top panels; 08-12, middle panels; 14-18, bottom panels). GFP-Cdc20 (top and middle panels) or GFP-Mad2 (bottom panel) kinetochore signals were used as cell cycle progression markers. Top panel, the arrows indicate the arrested kinetochores in 02-06. The area marked by an arrow in 01 indicates that before colchicine treatment, GFP-Cdc20 is excluded from the late interphase nucleus. Middle panel, in the absence of endogenous Mad2, GFP-Cdc20 signals continue to oscillate in and out of the nucleus, and on and off the kinetochores, although cytokinesis appears to be defective, as would be expected in embryos lacking microtubules, in the presence of colchicine (indicated by arrows in 07-12) suggesting a failed SAC function in arresting cells in response to colchicine treatment. Separation of daughter nucleus failed in picture 10. Bottom panel, arrowheads in 14-18 indicate arrested kinetochores with accumulated GFP-Mad2 fusion proteins to suggest the functional GFP-Mad2 in rescue the SAC defect phenotype in Mad2 mutant embryo. Arrowhead in 13 indicates GFP-Mad2 accumulation in a late interphase nucleus. Bar=5mm. The embryos were microinjected with ~1% egg volume of a 100mg/ml colchicine stock solution in 1 x PBS. The protocol described here is a generic method for imaging fly syncytial embryos using a Leica TCS SP2 confocal laser scanning microscope and can be modified to suit other microscope systems and can also be adapted to study other gene functions using Drosophila syncytial embryos. We have used this protocol to study many aspects of the spindle assembly checkpoint, protein dynamics and protein proteolysis using transgenic flies or polyclonal antibodies to visualize the protein localisation in living or fixed samples4,6,12-14 . It is simplest to keep the flies in fresh fly food vials when collecting small numbers (~10 - 100) of eggs. This reduces the hassle of making and preparing additional apple juice agar plates and egg collection chambers as described in other publications15,16. The addition of a small square of broken coverslip glass at one end of the glue strip on the coverslip makes it a lot easier to open the needle and determine the injection volume by adjusting the microinjection system settings while the needle is immersing in the 10S oil. The degree of desiccation of the embryo is important for the success of the injection in avoiding leakages and maintaining the embryos viability especially for those experiments which require a long period of time or when raising transformants after injection. However, there is no golden rule for exactly how long desiccation is required. This varies from experiment to experiment and depends on the amount of the solution injected and the humidity of the working environment. The functions of a specific protein of interest can be manipulated by microinjecting specific protein inhibitors, mono- or poly-clonal antibodies against a specific protein, messenger RNA or fluorescently labeled peptides under wild type or genetic mutation backgrounds. Many of these mutant lines or GFP-tagged transgenic lines are publicly available from Drosophila stock centers and most of them are listed on Flybase (http://flybase.org/) and can be searched for online. This protocol was developed under a Wellcome Trust grant. We thank Ms. Maureen Sinclair for maintaining the fly stocks and preparing the fly food over the years. We would also like to thank Mr. Michael Aitchison for his help and technical support in developing of this protocol. Confocal imaging system: The imaging system described in this protocol is a Leica TCS SP2 laser scanning confocal inverted microscope system. The method described is also suitable perhaps with some minor modifications for other imaging systems. Dissecting microscope: We use an Olympus SZX7 with DF PLAPO 1X-4 lens. Needle puller: Flaming/brown micropipette puller (from Sutter Instrument, Model: P-97). Microinjection system: An Eppendorf microinjection system is described but any other appropriate system can be used. Fly food distributor: Jencons Scientific Ltd peristaltic pump. Table 1. Fly food ingredients. Holocarbon 700 and 27 oils purchased from Sigma. Dry yeast: Thomas Allison, UK. Preparing the heptane glue: Take about 1.5 meters of double-sided Scotch tape, put it into a 15ml Falcon tube with 5ml of heptane and rotate for 3-5 hours or overnight. After that time split into 4 equal aliquots in 1.5 ml eppendorf centrifuge tubes and spin for 5 min at a fast speed in a bench-top centrifuge to remove any debris. Store the heptane glue solution in a 10ml volumetric flask and keep for use. The glue strength will vary according to the concentration and the amounts of the glue used. Normally, the thinner glue produces lesser noisy background when scanned by confocal microscope. Holland, A. J., Cleveland, D. W. Boveri revisited: chromosomal instability, aneuploidy and tumorigenesis. Nat. Rev. Mol. Cell Biol. 10, 478-4787 (2009). Zekanowski, C., Wojda, U. Aneuploidy, chromosomal missegregation, and cell cycle reentry in Alzheimer's disease. Acta Neurobiol. Exp. (Wars). 69, 232-253 (2009). Buffin, E., Emre, D., Karess, R. E. Flies without a spindle checkpoint. Nat. Cell Biol. 9, 565-572 (2007). Tang, Z., Shu, H., Oncel, D., Chen, S., Yu, H. Phosphorylation of Cdc20 by Bub1 provides a catalytic mechanism for APC/C inhibition by the spindle checkpoint. Mol. Cell. 16, 387-397 (2004). Huang, J., Raff, J. W. The disappearance of cyclin B at the end of mitosis is regulated spatially in Drosophila cells. EMBO Journal. 18, 2184-2195 (1999). Xia, G. Conformation-specific binding of p31(comet) antagonizes the function of Mad2 in the spindle checkpoint. Embo. J. 23, 3133-3143 (2004). 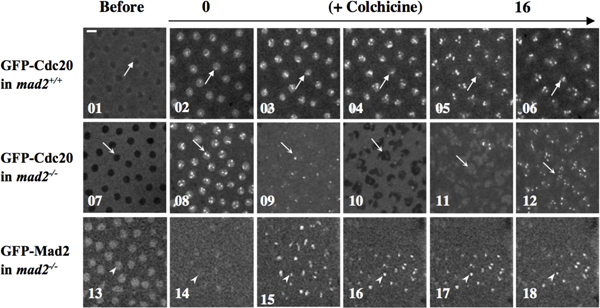 Lorca, T. Fizzy is required for activation of the APC/cyclosome in Xenopus egg extracts. Embo. J. 17, 3565-3575 (1998). Howell, B. J. Cytoplasmic dynein/dynactin drives kinetochore protein transport to the spindle poles and has a role in mitotic spindle checkpoint inactivation. J. Cell Biol. 155, 1159-1172 (2001). Foe, V. E., Alberts, B. M. Studies of nuclear and cytoplasmic behaviour during the five mitotic cycles that precede gastrulation in Drosophila embryogenesis. Journal of cell science. 61, 31-70 (1983). Li, D., Morley, G., Whitaker, M., Huang, J. Y. Recruitment of Cdc20 to the kinetochore requires BubR1 but not Mad2 in Drosophila melanogaster. Mol. Cell Biol. 30, 3384-3395 (2010). Karess, R. E. P element mediated germ line transformation of Drosophila. DNA cloning: A practical approach. Glover, D. 2, IRL Press. Oxford. 121-141 (1985). Wakefield, J. G., Huang, J. Y., Raff, J. W. Centrosomes have a role in regulating the destruction of cyclin B in early Drosophila embryos. Current Biology. 10, 1367-1370 (2000). Huang, J. Y., Raff, J. W. The dynamic localisation of the Drosophila APC/C: evidence for the existence of multiple complexes that perform distinct functions and are differentially localised. Journal of Cell Science. 115, 2847-2856 (2002). Raff, J. W., Jeffers, K., Huang, J. Y. The roles of Fzy/Cdc20 and Fzr/Cdh1 in regulating the destruction of cyclin B in space and time. Journal of Cell Biology. 157, 1139-1149 (2002). Brust-Mascher, I., Scholey, J. M. Microinjection Techniques for Studying Mitosis in the Drosophila melanogaster Syncytial Embryo. J. Vis. Exp. (31), e1382 (2009). Figard, L., Sokac, A. M. Imaging Cell Shape Change in Living Drosophila Embryos. J. Vis. Exp. (49), e2503 (2011).